I’ve always had one foot firmly planted in the world of all things horror. Movies, novels, comics, video games, you name it, I dig it. I’ve also been an avid sports and trading card collector off and on since I was a kid. It wasn’t often that the two worlds overlapped. Sure, every few years there would be a horror movie that would garner enough mainstream recognition that a trading card company (usually Topps) would put out an accompanying card set. However, these sets were usually halfhearted and puerile consisting of still photos from the movie with a humorous caption. While somewhat entertaining and mildly amusing these sets never really satisfied a more mature collecting audience. It’s only been as of recently that there has been any type of serious horror trading card releases. While these cards have not been available as a part of a bigger truly dedicated horror set they have filled that niche that both horror and trading card fans have been waiting for. With these Cardboard Shivers blog posts I’ll feature a horror themed card, give my thoughts on it and provide some links on where to pick up one of your own. The Allen & Ginter sets have always been a favorite with collectors. Featuring hand painted images reminiscent of the original 1880s cards that they’re modeled after. The cards depict modern day Major League Baseball players as well as celebrated athletes from other sports, political figures and other noteworthy individuals. They’re also known for including offbeat subsets which pay homage to such diverse subjects as famous haunted houses, military battleships and endangered species. 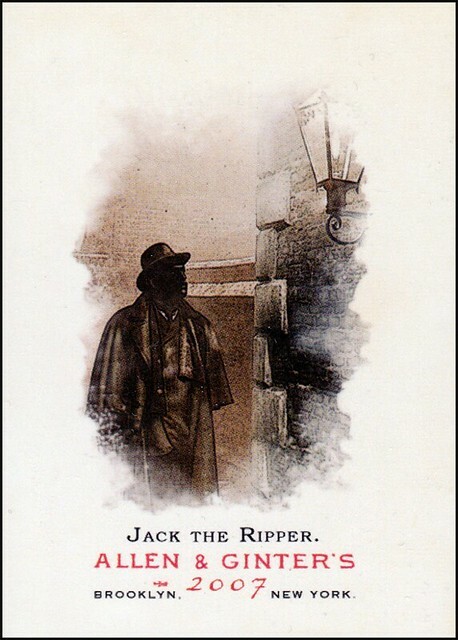 Card #228 of the 2007 set features a shadowed figure in a derby hat, skulking through the fog shrouded streets of London’s Whitechapel District: the universal image that is conjured when one thinks of Jack the Ripper. 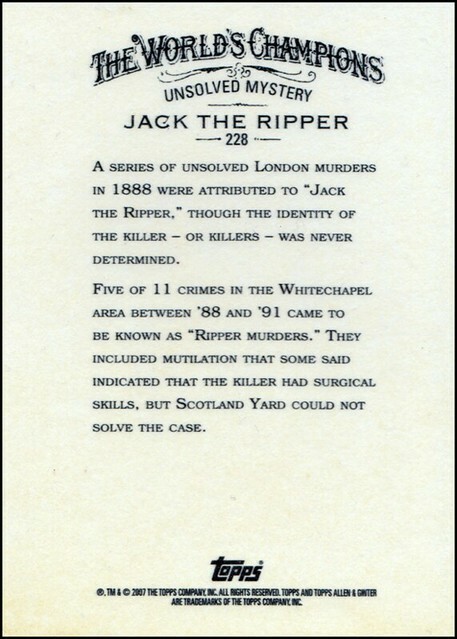 The back of the card provides a brief overview of the Whitechapel Murders and their unknown orchestrator. One thing that seems a bit off though is that the top of the card reads “The World’s Champions”. While I understand that every card in the set was marked with this moniker and all other cards really did feature individuals of championship caliber, it just makes it sound like Topps consideres Jack the Ripper a champion murderer. However, considering that his or her identity is still a mystery and that people all over the world continue to puzzle over the murders, maybe Jack the Ripper should be considered a World’s Champion of serial killing. Hit this LINK or this LINK to pick up a copy of this card for your collection.